This Saturday the party will be in Howell, Michigan at the Hartland Performing Arts Center. No, I am not joking. This is where Andrew W.K., Wilson, Flint Eastwood, Anti-Flag, The Swellers, Diamond Youth, American Opera and about 65 other acts will be playing live for an event called Bled Fest. Started nine years ago, Bled Fest is the only festival of it's kind. It takes place in a school and features five stages throughout the building. The best part is that you can see all of these great bands for only $25. The fact that the organizers of this festival are able to book such huge acts and keep the price so low says a lot about the companies that sponsor this event, which include Fusion Shows, Run For Cover Records, No Sleep Records, InkAddict, Capeside Records, Top Shelf Records, Northwestern Mutual and Students for Choice. 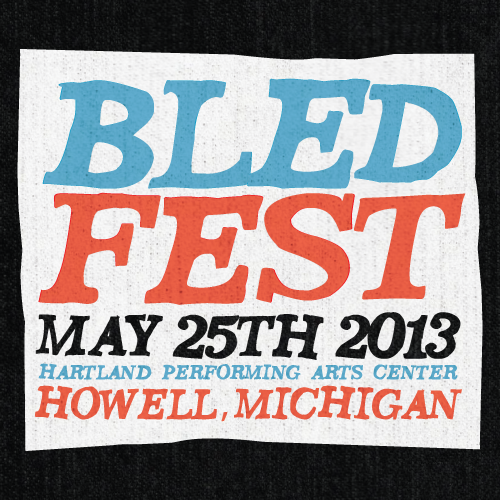 The best part about Bled Fest is that it's all ages so no one has to be left out. This also means that there is no alcohol served at the event or allowed inside, but all of you drink too much anyways so you could use a day off! Take this as an opportunity to actually remember how much fun you had the next day. The party starts bright and early at 11:30 a.m. Word on the street is that Andrew W.K. may be hanging out stage-side during the Flint Eastwood set sporting a bolo tie. Wilson was enough to get us to the show, so everything else is a bonus! Any one of these bands are worth the admission price of the whole festival. For more information or to purchase tickets, head over to bledfest.com.